Second Monster March is over and it was my absolute pleasure to host the painting challenge again! I would like to thank all the participants for responding to the call. It was an honor to host you and to present your fantastic models at various stages, from assembly to finished, beautiful master pieces! I would also like thank the guys from Kings of War Australia group who supported the initiative by changing the group photo regularly to showcase a monster painted by a group member. Cheers guys, it was awesome to have your support! In this post I am going to summarize the painting challenge by posting the photos of the models participants sent that present their chosen model either as a finished project or in the most recent stage. 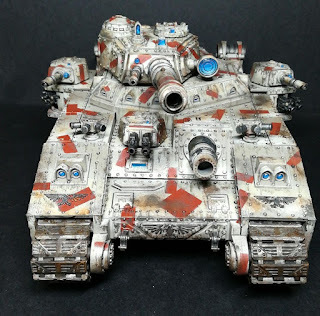 Cylde made a great contribution with his monstrous Baneblade superheavy tank and finished his project ahead of time! Well done! Caladaris put the bar high for himself and tackled more than one model at the same time. And he made it! That is a fantastic achievement, congratulations! Especially that he also took time to write in detail about his painting process, paints used and spiced it up with some really cool stories. 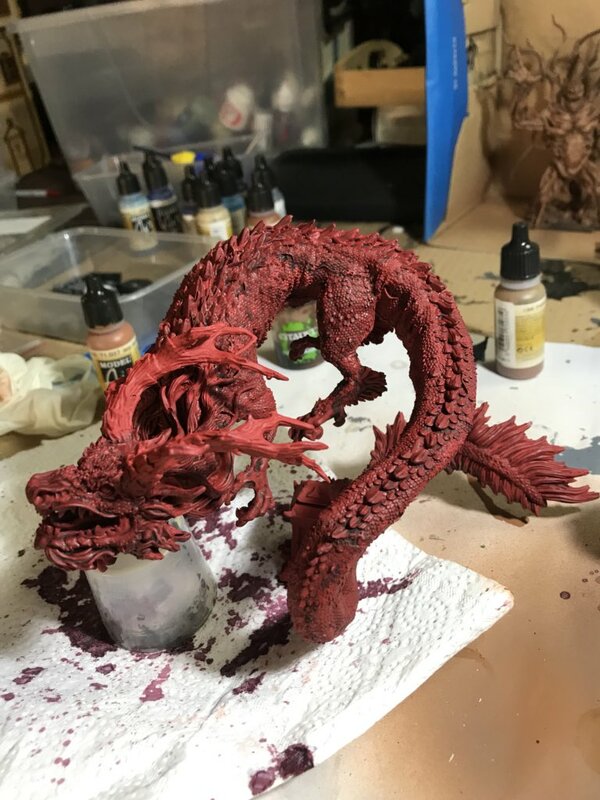 Darth was working on his new Dragon that came together with one of the kicstarters he backed up and the model is getting some nice red painting applied! 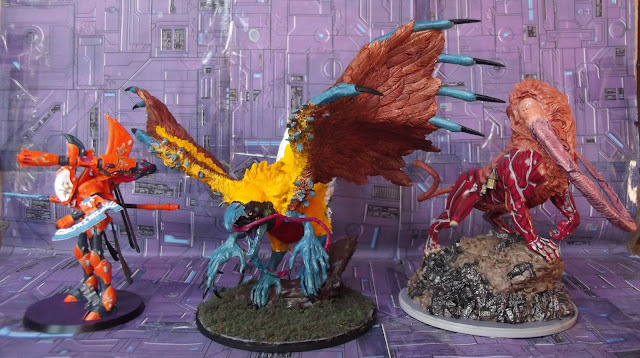 I can't wait to see entire army made up of the models he got as these two examples are fantastic! Keep up the great work! Ed contributed to the challenge regularly and he planned his project perfectly so that he could post some WiP pictures every week and finish exactly in time! 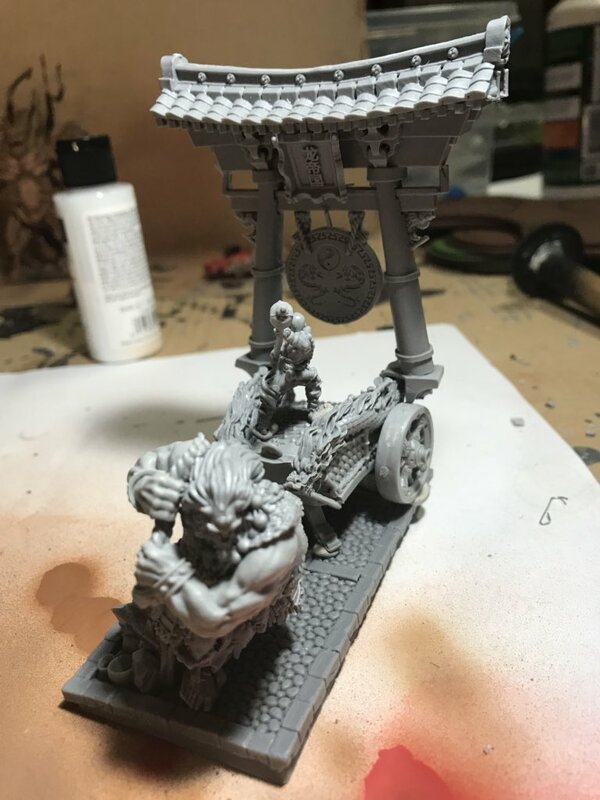 What a wonderful model! Thanks a lot for your contribution, Ed! 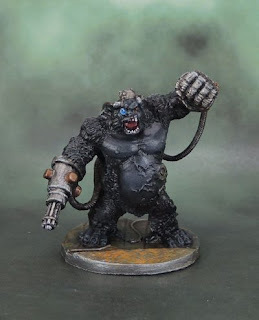 Matt painted a very cool model for his Forces of the Abyss army. I really like his unique painting scheme and choice of the model for the Archfiend to lead his minions to battle! 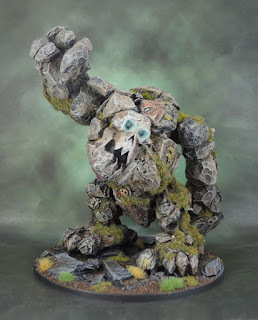 Nathan had really cool idea and picked a very nice model of the Greater Earth Elemental for his Kings of War army. 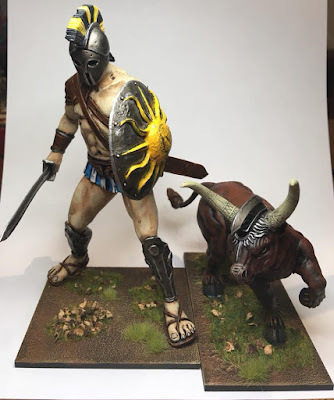 He executed it very well and it definitely made the model look unique and personalized. Really well done guys! I congratulate you on your efforts and once again, thanks so much for your contribution. 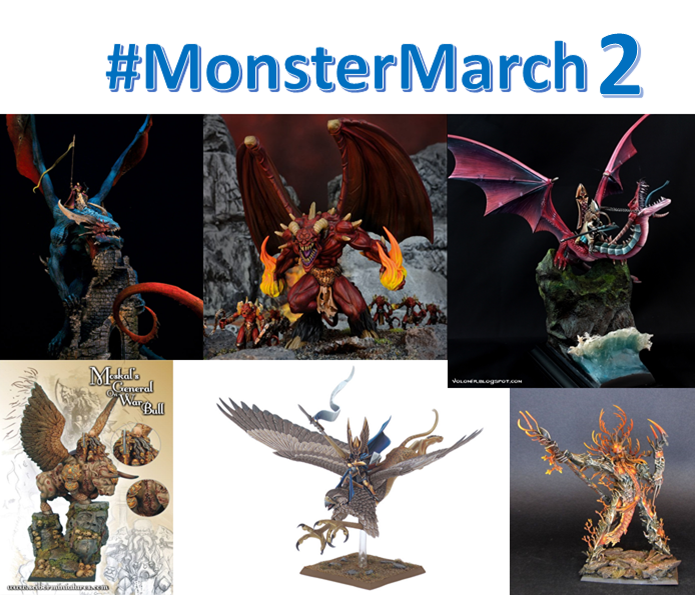 You made Monster March 2 a fantastic painting challenge and an inspiration for many others! There are some of us who really wanted to participate and contribute but unfortunately it didn't happen. I think I am the best example myself. I am really sorry for that as I hoped I can progress with the painting at least. I would like to take as much as possible from that challenge and try to understand what happened that in the end resulted in me not painting the model I wanted to. 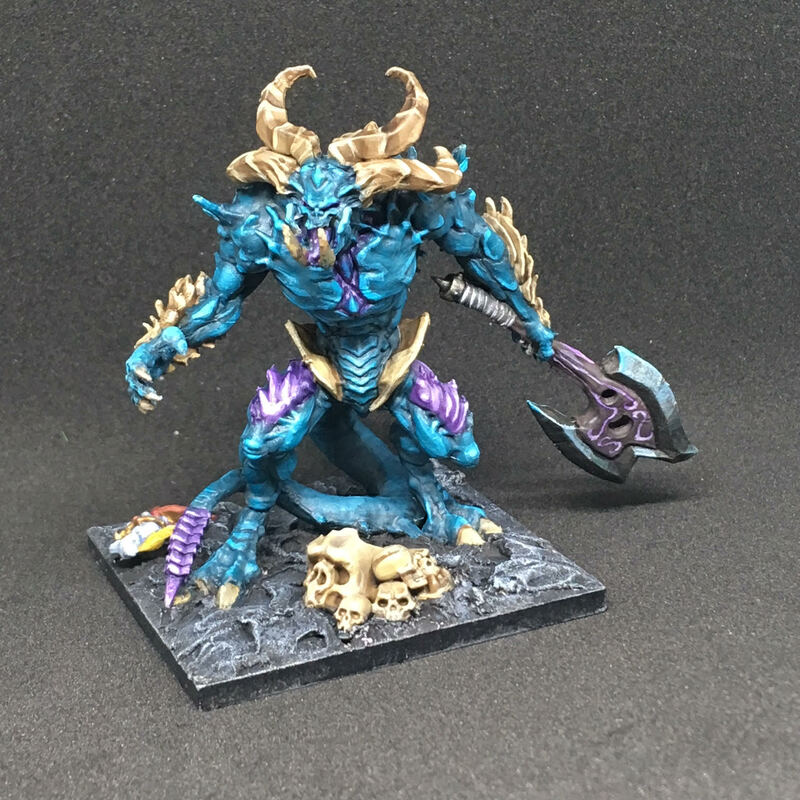 I assumed I would be able to coordinate a few things in March so that I would be able to spend some time on painting the Drakon Lord for my Kings of War army. 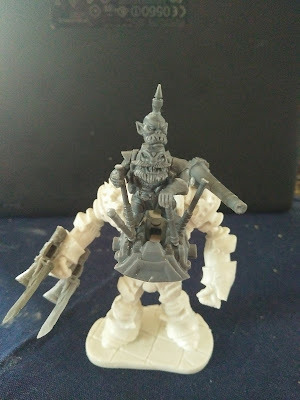 One of the parallel project I had was to prepare 10mm army for Mortem at Gloriam historical system. I have not played it yet and there is a small event next weekend where I am going to have a chance to do so. 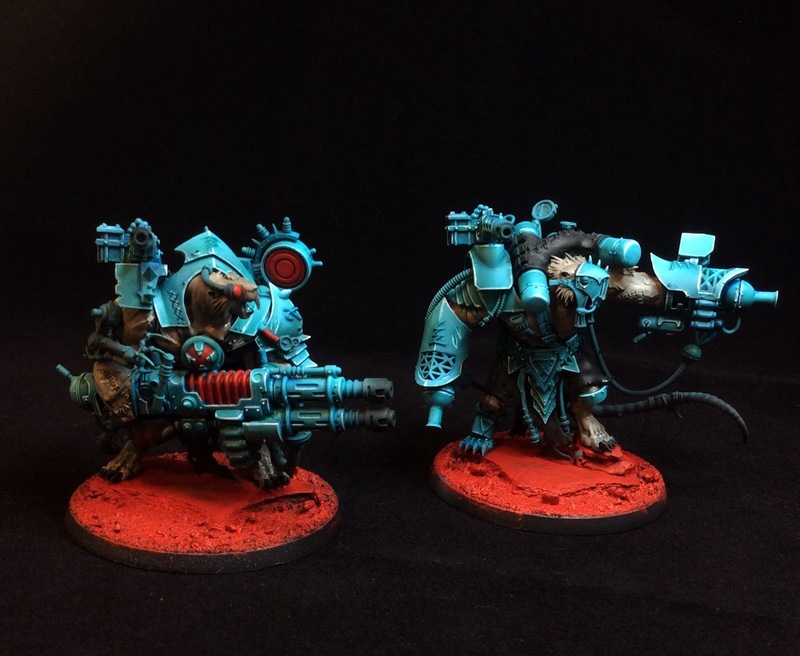 The models required cleaning, undercoating and some drybrushing for the very basic colors. I thought this process is going to be straightforward and while it was I often found that I already spent time and energy on painting. That led to the second observation. 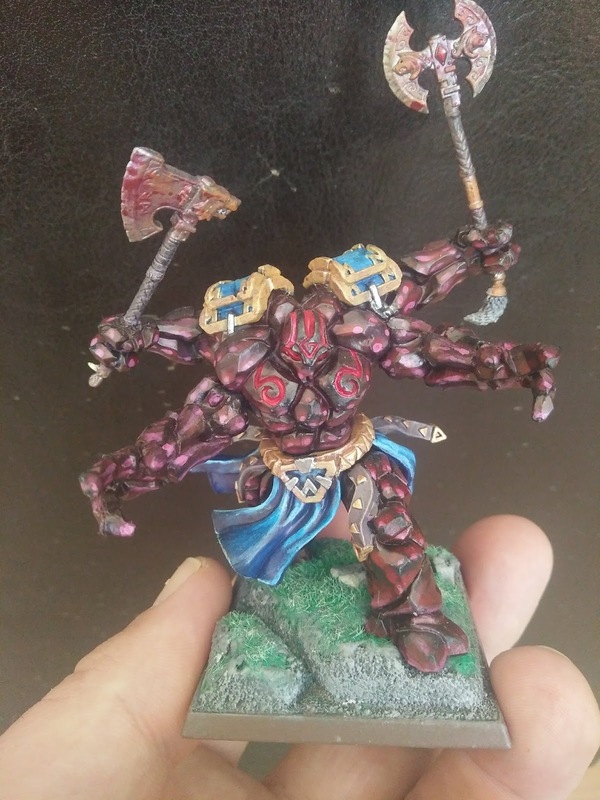 After doing even some simple painting (or other activities for that matter) I was concerned if I could maintain the focus to paint at the highest available level for me. The model I chose for Drakon Rider is beautiful sculpt and I felt I would risk making too many mistakes if I started painting while not perfectly rested. But then I found out that such state is a rare condition. Perhaps the lesson is to keep painting no matter what and simply slow down during the process to make sure the quality is kept? 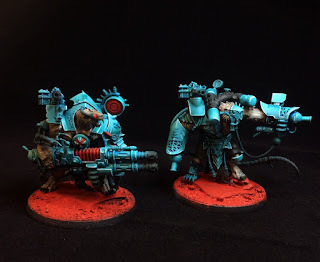 I also think that whenever I painted, even if I had entire unit to paint, I did not do it in a strictly planned process. I tried to find a bit of time every evening but I didn't quite plan what I am going to finish during the session and what goals I want to achieve every week, for example. Hence, it was always more about "I finish when I finish" and often resulted in projects taking longer than initially anticipated. 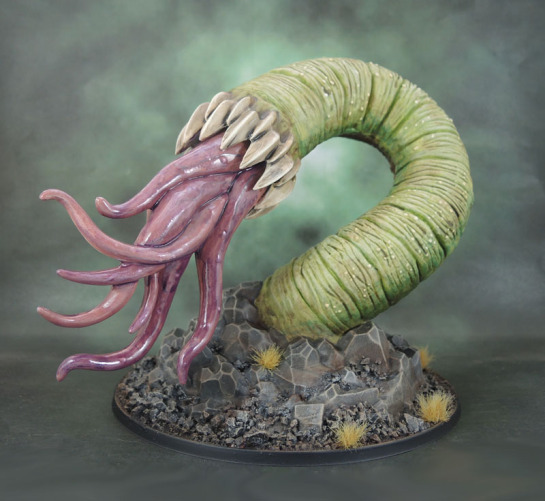 I wonder if you guys would be so kind and share your approach to the painting challenge. What works for you and how do you accomplish the goal? At the same time, if you did not achieve the one you set at the beginning, what do you think was the reason? I wish you all the best in your future painting projects! Please, share them whenever you have time to do so. It was absolute pleasure to follow the progress and I will be checking the blogs for more updates for sure! And hopefully we will see each other next year! It felt good to participate & its great seeing the varied completed entries as well. I now need to push myself into an April Action and get working on my backlog. Thanks a lot for joining! It was definitely great to see such a variety of models and ideas! I am sure that with the momentum gained in March you will keep the pace through April and beyond! The momentum is still with me as I have managed to paint another monster(KDM watcher) and 11 survivors since. 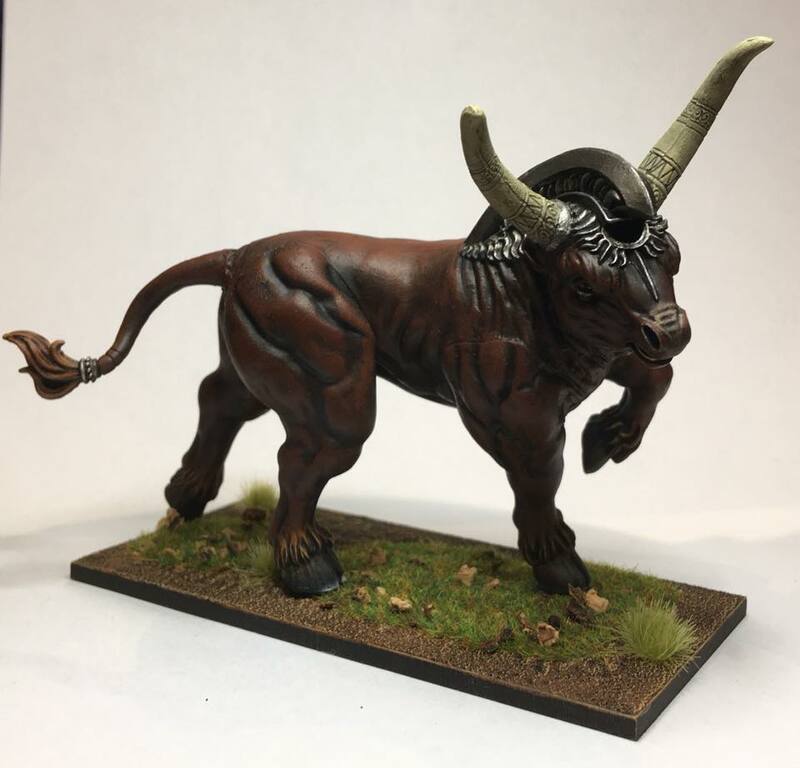 I am trying out a NMM technique for the first time with the final KDM base game miniature (Gold smoke knight). Monster March gave me a big push to try and realise my ideas. Two is way more than I did :D Thanks a lot for participating, I am glad you enjoyed it and let's catch up next year for more! Thanks a lot for running this marvellous project. i've enjoyed a lot being parto of it, painting and seeing others advances. And of course if anyone has questions of how i painted the baneblade just write me a word. Thanks for running Monster March again, it was great to take part! As for organizing my painting, I have found that the more I plan and track my progress, the better I am at completing projects in a timely manner. I am using an excel spreadsheet for my Adeptus Mechanicus army which lists out each unit and the percentage completion of that unit. I have monthly goals which grow the army by 250 points per month and mostly I hit them. The trick is to paint every day, even if it's just for 15 minutes then update the spreadsheet as you go. It's really motivating and has been working well for me this year. For the Castigator, I made a separate tab listing each different painting task and filled in a completion against each of them. I find it helpful to break a large model down into smaller pieces. I think the old saying "fail to plan is a plan to failure" can be applied to such a project as Monster March. There is no single way to do it and I thought following the schedule I set for each week in the first post would work. It seems it needs more and your approach is a great example of what actually does work. Do you mind sharing a bit of more details on how did you break down your project? I am wondering how detailed that spreadsheet may be. The spreadsheet isn't super detailed. Basically I broke the Castigator down into 14 tasks that seemed like sensible working stages and then just put a percentage completion against them. I treat them all as equal chunks of the project (even though they probably aren't) and make a cell at the bottom that tells me the overall completion of the project. For example, I had titles like 'Metal blocking including gun' which would be 100% complete when all of the metal colours on the main body and gun were blocked out. Then I had other tasks like 'paint knees' which should be fairly self explanatory. 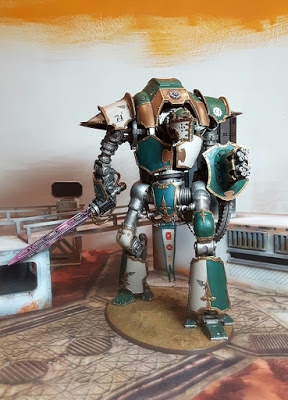 I'm doing the same thing with the knight Armiger I'm currently working on and it's helping me push to the finish line.